Whether your a costume designer working on a new production or simply a passionate larper wanting that dream armour created, Black Raven Armoury are here to help your bespoke designs. With over 20 years experience, there are few themes I haven’t worked with and in this time have developed & collected a vast library of source material, meaning what ever it is you are looking for, I will create something unique for you, 100% to your brief. How does my bespoke service work ? I pride myself on tailoring every single project to each client individually, which means the first things I ask for are “Deadline” & “Budget” both critical in my view, in creating a design that I can not only make in time, but also that you can afford!! Quality and craftsmanship, made in England my team of enthusiastic and professional craftspeople are all highly experienced having produced countless bespoke film projects over the years. Intricate leather patterns are hand-embossed and edges are hand finished. 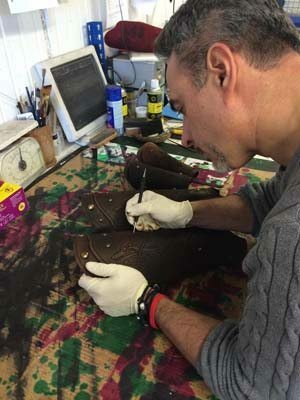 employing good old fashioned tooling techniques that have been used for hundreds of years – water forming, hardening and hand dyeing – to form and finish the leather. 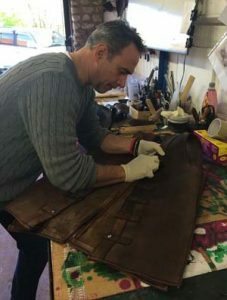 All our leather is professionally antiqued to age it, so it always looks properly authentic and never shiny and new like it’s just come out of the shop. Working closely with museums and archives who give us access to ancient artefacts so we can accurately recreate historical leather items. Alternatively, if you are looking for something a bit different and totally unique, we can design and manufacture completely bespoke and sometimes quite unusual leather & sculpted products from a simple drawing. Plain or intricate, all designs possible. Black Raven Armoury produce bespoke leather armour and leather clothing, props and accessories for the film industry, theatre productions, Computer Game developers, costume hire companies and individuals alike, including Larp and Re-enactment. Whether you need authentic leather armour from the Roman, Celtic, Viking or Norse periods; historical leather costumes from the Bronze, Medieval or Middle Ages; costumes for fantasy pirates, futuristic Science-Fiction or Anime characters; or something completely different, I can design and manufacture it for you in quality leather. All to often armours & costumes are designed & constructed to look stunning….. Until the moment you have to sit down and eat! Whether it’s simple comfort or keep warm in the rain, possibly even the practicality of being able to wear your costume on horseback, all these little details are important, so prepare yourself for a grilling ! – I’ll take your brief and on confirmation of the commission and payment of your deposit will produce an initial conceptual idea for you to choose from. – From here, a detailed list of measurements will be taken and the patterning process begins. You’ll be kept informed weekly on the progress of your commission, including photographs just to make sure at all stages your happy all the way through to completion. Something I’ve always prided myself on is creating a complete feeling of authenticity in everything created. Years of research and a huge library means no matter the look and feel, every little detail can be created, be it hand tooling of complex Norse knotwork or small detail stamp work, I have the tools to hand to create something special.